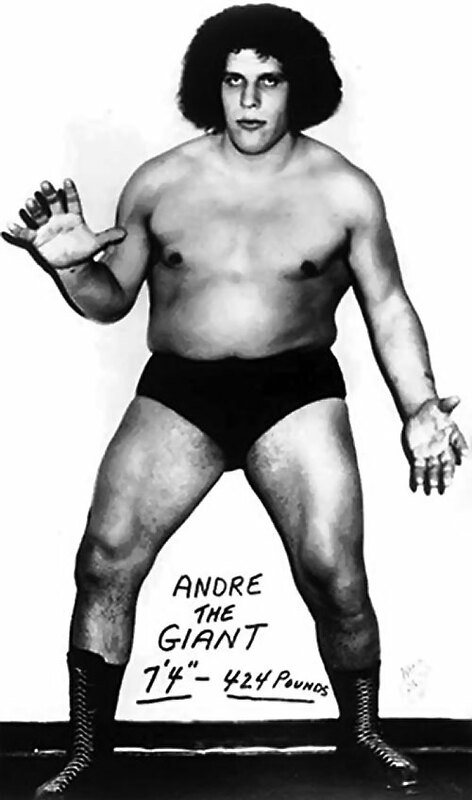 André was the most popular wrestler of his era, arguably the most popular wrestler of all-time until Hulk Hogan appeared on the scene. With appearances on shows ranging from “The Tonight Show” to most of the popular talk shows of his era as well as movie and television appearances, his name was a household word to people who did not even watch Professional Wrestling as well as to fans. 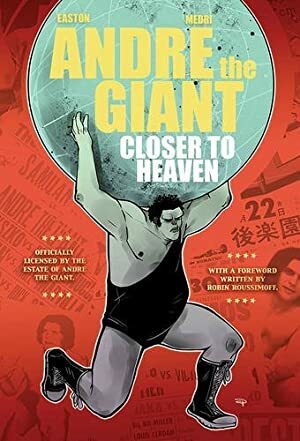 This profile is not about the real life of André the Giant but about the character he was portrayed to be in his wrestling career. Real life elements may slip in from time to time if they add drama to the story but this is the fiction, not the reality. Where accounts differ, I went with either the most popular version of the story or simply the one I liked better. Sometimes, I just made it up. You might note that I am vastly exaggerating him to true superhuman levels. 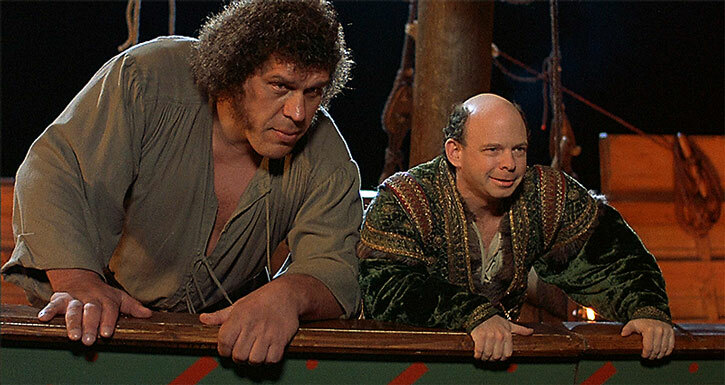 Most of the pictures in this profile that are not The Princess Bride screencaps are quoted from a blog called The Selvedge Yard , which has context for most of them. Real Name: André René Roussimoff. Group Affiliation: The Machines, the Colossal Connection. Base Of Operations: WWWF/ WWF territories. Height: 7’5” Weight: 425-550 lbs. Born a genetic giant (or was it really natural at all? ), André towered over 7 feet tall and had about twice the mass one would expect even for his height. He was known to overturn heavy vehicles filled with occupants and survived two knife attacks without injury. His drinking was so legendary as to constitute a power unto itself. 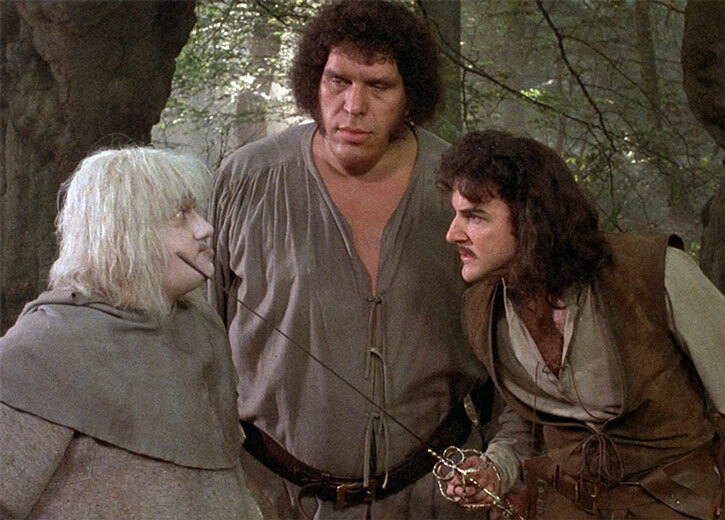 A surprisingly touching short video about André’s time shooting cult movie The Princess Bride, with anecdotes from the cast. Reportedly, making the movie was an amazing experience. Born in the small village of Grenoble in the Alps of France in 1946, André was twice the mass of a normal baby at birth and easily more than twice as strong. Myths abound. 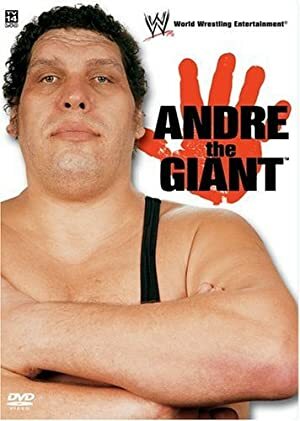 Some say André was simply a genetic giant. Some say that his parents were not truly his parents at all, that they found him in a basket that had been placed in a river and floated downstream from mysterious, mist-shrouded regions of the mystical mountains. Others say his grandfather had once known a professor named Danner and learned some secrets from him. Whatever the truth may be, André was at least as strong as an average grown man by the time he was 5. He worked the small farm his father owned. By the time he was 10, he was over 6 feet tall and tossing bales of hay all the way from the haying field to the barnyard. Although he was twice the size of everyone else and did 10 times the work, his father did not think he should get more to eat than anyone else and so he always felt hungry. As a teenager, André quit school as he did not perceive a higher education being part of his life. He was walking through the woods on the way home from his last day in school when he emerged onto the dirt road that led to his parents’ house. There he saw that a huge tree had fallen across the road and a car was stopped in front of it. A small man, to André’s eyes, was trying to move the tree. Feeling in a genial mood, André walked over. The man was terrified at the sight of the towering giant but André smiled and easily lifted the tree, throwing it far from the road. 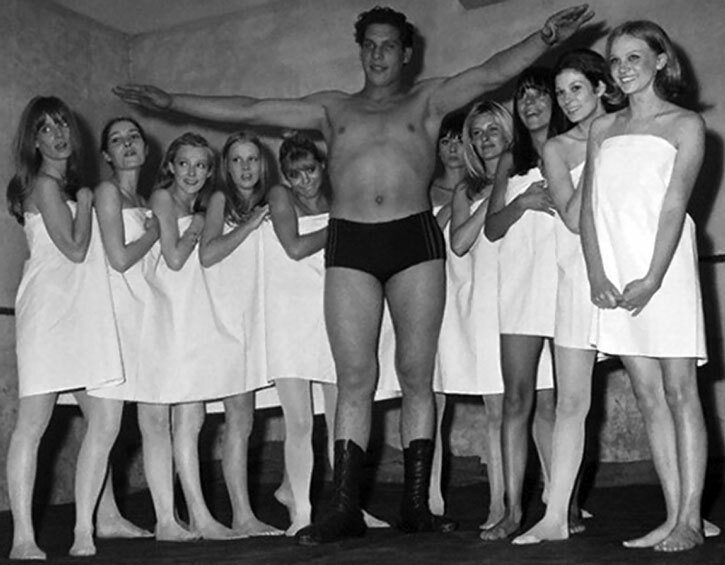 Amazed at this friendly giant’s superhuman strength, the man introduced himself. He was Edouard Carpentier, a famous professional wrestler. 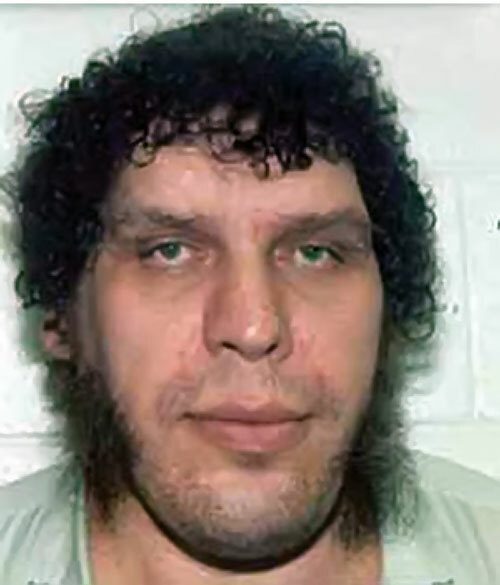 He saw the potential André had and offered to train him to become a professional wrestler. Seeing this is a way out of his unhappy lifestyle, André readily accepted. 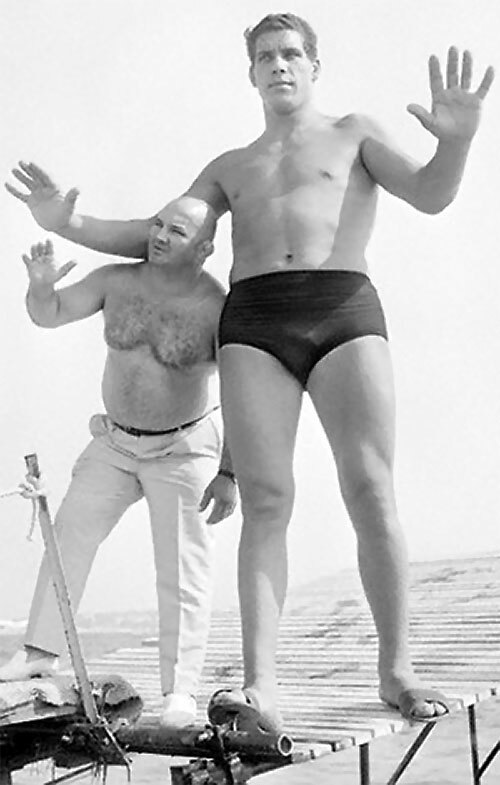 Carpentier took André to Paris where the Giant trained in his wrestling school. 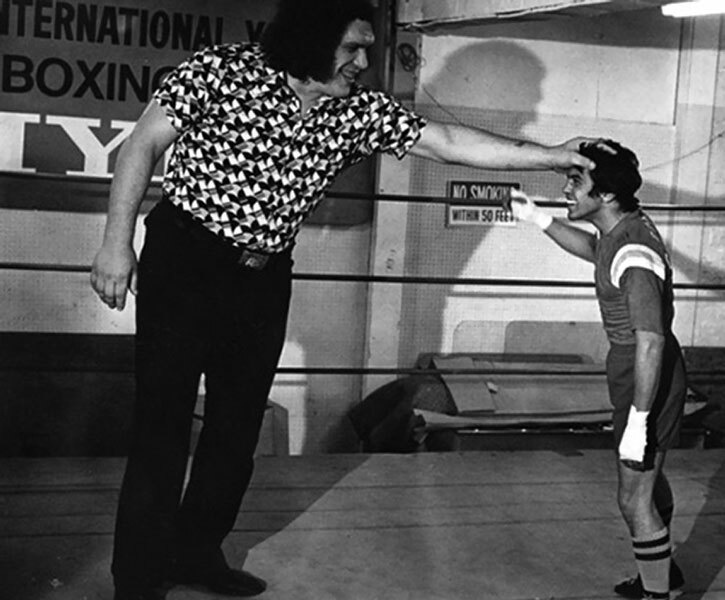 André discovered that other men could gain a temporary advantage over him with their knowledge of leverage but, even in those earliest days, no one could pin him or get him to tap out. He also had to be very careful, holding back to make sure he did not injure or kill anyone. In those early days, André also gained experience with women, who often seemed drawn to him magnetically, and learned the joys of fine cuisine and fine wines. He was dedicated to his craft and was put into his first match within 6 months, in 1964, a match he readily won. In those early days, he was billed as Jean Ferré. This was the name of a giant lumberjack out of folklore, a French equivalent to the American folktales of Paul Bunyan. Over the course of the next six years, André remained undefeated. Technically, he did lose some matches. Once in a while, a faster opponent would run out of the ring again and again and André would chase him out only to have the opponent dart back into the ring just in time to beat the count and André would be counted out. Likewise, he had a temper and occasionally got disqualified. But these were not considered true losses. He was never pinned or forced to submit (tap out). Nor was he ever lifted completely off the mat and body slammed. Ironically, he was quite adept at dropkicks in his younger days. By the early 1970s, Carpentier felt it was time to let him go. André was destined for greater things. As much of a cultural Mecca as Paris was, the Mecca of wrestling was the United States. His first stop was Canada and specifically Montréal, a natural choice for a man who spoke French as his native language. He headlined there for a couple of years. But the fans began to lose interest as it became obvious that no one could beat him. 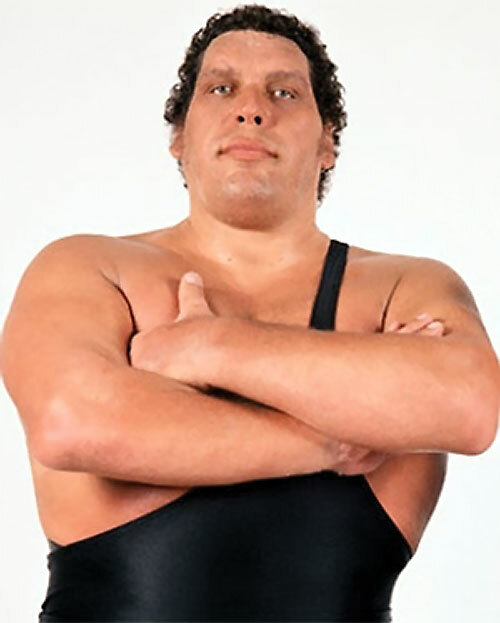 In the United States, André wrestled for the AWA and also had NWA matches. Then Vince McMahon, Sr. stepped in. He realized André was being promoted “all wrong”. Keeping him in one place was a mistake. McMahon put him “on the road” where he would remain a novelty, a traveling do-gooder who would come in, hand a humiliating defeat to the local arch-villain, and then move on. McMahon also advised that André stop doing moves like dropkicks and instead emphasize his size and strength. At the same time,. McMahon realized that giving André a title shot would be a horrendous mistake. Once André became Champion, nobody would ever be able to take it away until the day he retired and the fans would become bored with it. Keep in mind, this was in the days before there were many superhuman wrestlers like there are now. It was during this era that legends about André began to abound in three areas. First was his strength. In a bar one night, a group of drunken college boys started taunting him. André tried to ignore them but finally had enough. With a bellow, he went for them. They suddenly realized 4 against one was not enough and they ran for it. Locking themselves in their station wagon, they tried to drive away, only to realize the car had been lifted off the ground and then flipped over. They crawled out, André allowing them time to do so. When the police arrived 15 minutes later, the youths claimed André destroyed their vehicle. The police wanted to know what vehicle as it was gone. When they found it in an abandoned, fenced in parking lot two blocks away, the police refused to believe the claim of the boys that André threw the vehicle that far and the boys were arrested for public intoxication. Secondly, there was his durability. On at least two occasions, bar patrons attacked André with knives. Both times, he hit them with bar stools and knocked them out. But witnesses swore they got in close and stabbed before he did that. These reports were dismissed as there were no wounds, though his shirt was torn. Thirdly, there was his ability to consume humanely impossible amounts of alcohol and not only stand up and walk but pass sobriety tests. 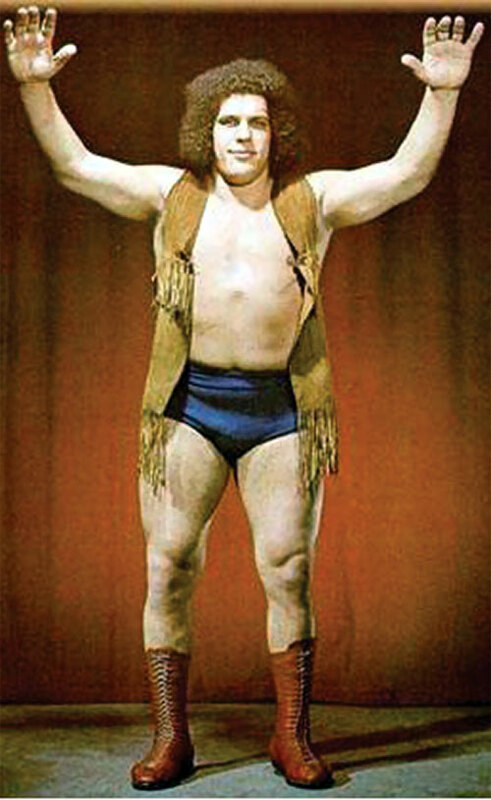 André went undefeated in the World Wide Wrestling Federation, which was later shorted to the World Wrestling Federation. 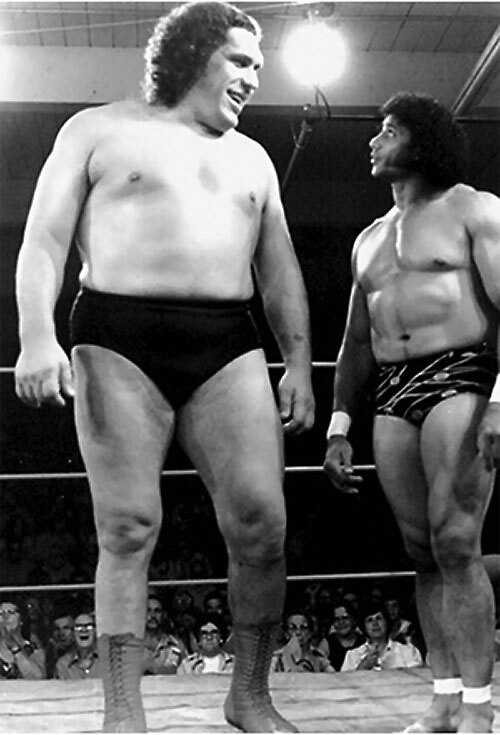 In 1976, he even fought and defeated a top contender for the World Heavyweight Boxing championship in a wrestler vs. boxer match. André suffered his first injury in the early 1980s when the metahuman Killer Khan managed to fracture his ankle although André still managed to win the match. But it was a sign that serious superhuman opponents were starting to appear on the scene. Worse still, André was getting past his prime. During the Wrestlemania era, André was beginning to realize his career would not last forever. Having never been given a title shot in spite of being undefeated, he demanded that current Champion Hulk Hogan step into the ring against him despite their friendship as André wanted to go out by retiring as the undefeated WWF Champion. Hogan’s powers of emotional absorption were corrupting him ever more and he desperately tried to evade having to give André a title shot but the fan demand for it was too great. Perceiving big box office, Vince McMahon, Jr. made the match. Drawing upon power gained from the emotions of the fans, who he emotionally manipulated into perceiving him as the hero of the match, he managed to bodyslam André and finally, barely get a pin, handing André the first loss of his career. André had allied himself with Bobby Heenan for this match and that led to a number of other alliances as he became desperate to win the title before he retired. He made an agreement with “The Million Dollar Man” Ted DiBiase. The millionaire used his influence to get André another title match and, this time, André won. But the agreement was that André would have his hand raised in victory and officially be the WWF Champion- and then retire, naming DiBiase his successor. Keeping his word, André did so although WWF President Jack Tunney later ruled that a retiring champion cannot name his own successor. This led to a tournament to name a new champion. It brought about the third and last André vs. Hogan match, which ended in a draw, leaving inconclusive the question of who was really better. This was the end of the heyday of André’s career. He reconciled with Hogan, who was still not completely corrupted. He ended his career as a fan favorite and managed other wrestlers for a while before retiring. Mostly of interest for our Francophone readers, a 1960s TV interview and footage of his early career as a wrestler in France. Amusingly, his real name (Jean Ferré, which he still used back then) does sound in French close to “giant shod in iron”. André was not just tall. He was massive even for his size. His legs and arms were short and squat comparative to his overall body size. He was dark-complexioned with long, curly hair. His voice was so deep it was often hard to understand what he was saying. André was basically good-natured. He loved children. Stephanie McMahon named him as her favorite wrestler and admitted some of that was because her memories of him were the memories of a child. She could remember him carrying her on his shoulder when she was 5 or so. He hated being stared at and in later years, was not so friendly. 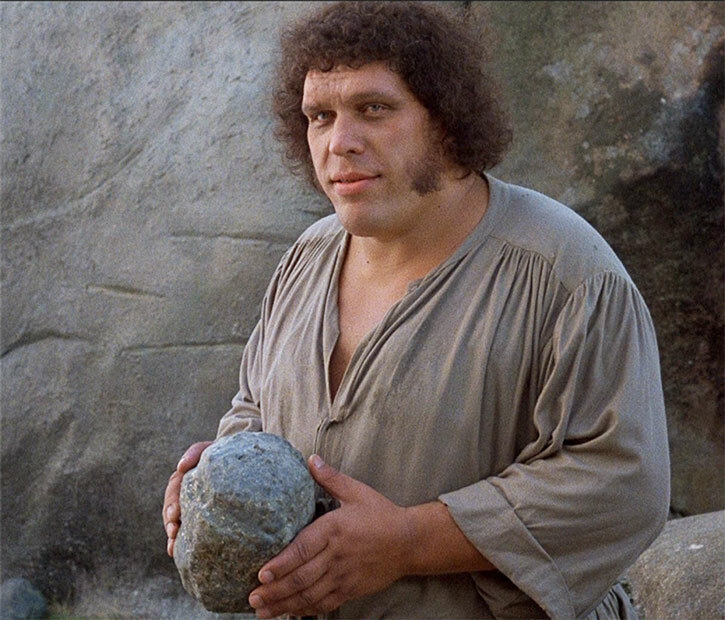 But most of his life, “Gentle Giant” was an apt term for him. In a world of super beings, Professional Wrestling might be quite real and quite superhuman. It would be completely appropriate to assume the “reality” of Professional Wrestling exists within the “reality” of DC Comics. Density Increase and Growth are Always On and Already Factored In. 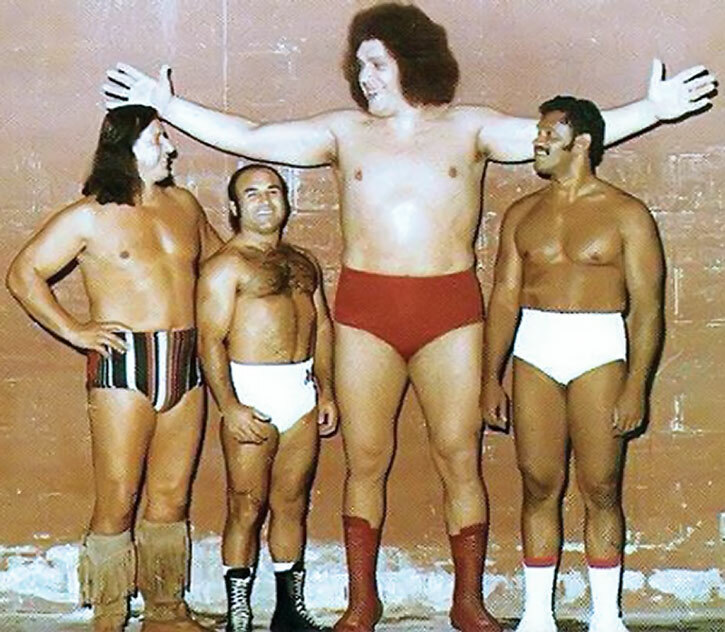 Vince McMahon, Sr. (High), Vince McMahon, Jr. (High), Bobby “The Brain” Heenan (Low). CIF of snakes, Strange Appearance. For purposes of Dexterity and Initiative, I give André the benefit of being in his prime although this is meant to cover his entire career. For Strength and Body, I am basing this mostly on the sorts of stats that other wrestling characters have been given in write-ups. This tends to focus on his “Face” career but there are some seemingly contradictory things. His Drawbacks, for example, only apply during his relatively short “Heel” era. Helper(s): Credit to Jessie Davis and his Hulk Hogan write-up which I take as being canon for purposes of this write-up. 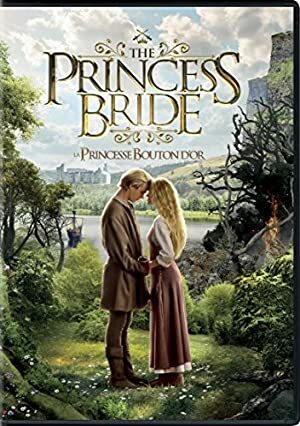 Most of the pictures that are not The Princess Bride screencaps are quoted from a blog called The Selvedge Yard , which has context for most of them.